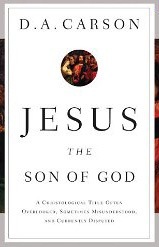 Jesus the Son of God: A Christological Title Often Overlooked, Sometimes Misunderstood, and Currently Disputed, Crossway: 2012, 128 S.
Although it is a foundational confession for all Christians, much of the theological significance of Jesus’s identity as “the Son of God” is often overlooked or misunderstood. Moreover, this Christological concept stands at the center of today’s Bible translation debates and increased ministry efforts to Muslims. New Testament scholar D. A. Carson sheds light on this important issue with his usual exegetical clarity and theological insight, first by broadly surveying Jesus’s biblical name as “the Son of God,“ and then by focusing on two key texts that speak of Christ’s sonship. The book concludes with the implications of Jesus’s divine sonship for how modern Christians think and speak about Christ, especially in relation to Bible translation and missionary engagement with Muslims across the globe. I know what it is to reject Jesus as the ‘Son of God.’ As a former Muslim, nothing baffled and, quite frankly, angered me more than hearing Christians call Jesus ‘the Son of God.’ I thought such persons were blasphemers worthy of condemnation. But now, nothing gives me more joy than to know that Jesus is indeed the Son of God and that the title ‘Son of God’ carries far more truth and wonder than I could have imagined. So I welcome this volume from D.A. Carson with all the enthusiasm and joy of one who once denied the truth that Jesus is the Son of God. With his customarily clear, warm, careful, and balanced manner, Carson gives us a fresh exploration of a precious truth that so many Christians take for granted and so many Muslims misunderstand. If you want to know Jesus and the Bible better, this surely is one aid that will not disappoint. Eine Kostprobe aus dem Buch gibt es hier: jesus-the-son-of-god-download.pdf. D.A. Carson: Ist die »Emergent Church« biblisch?